We can ignore the growing environmental crisis only at our own peril. At the root of the global and local environmental crisis is the cycle of over-production and over-consumption. Farmers throw out their produce on to the streets because there is no market for their produce. Traders and others use all kinds of tactics to persuade consumers to buy more and more products and services. “ buy one, get one free, eat as much as you can, children eat free, trade your old car for a new one, fly now and pay later” etc., etc., The result often is wasteful consumption that naturally contributes to environmental decay. The political leaders caught up in the interdependent global system of production and trade cannot imagine how they could contain production and consumption in a way that would help avoid an environmental catastrophe while still avoiding economic downturns that result in mass unemployment and poverty. When we built the southern expressway, we could not simultaneously upgrade the Colombo-Matara railway because one is by and large an alternative to the other. 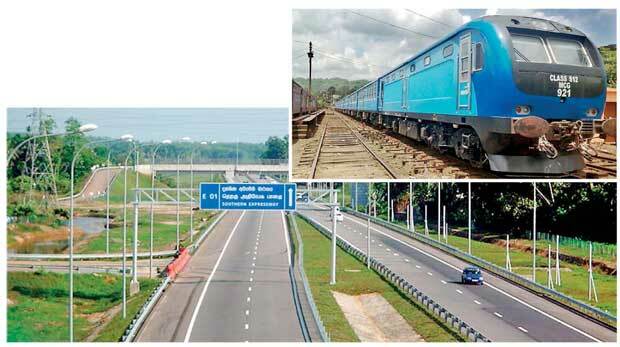 The same is true for Colombo-Kandy expressway as well as a possible expressway to Jaffna. On the other hand, the railway is always a far superior alternative to an expressway; no matter what criteria you use to evaluate the two options. Many long distance trains around the world run much faster than hundred km/hour, the speed limit for most expressways. Train services are far more equitable socially and economically, than road transport which favors the affluent at the expense of the lower income groups. Road transport is far more polluting and dangerous than railways. Continually moving road traffic generates a much higher level of air and noise pollution than trains that run at various intervals. Better roads naturally encourage more and people to buy cars and other vehicles, resulting in road congestion and traffic accidents. For a country like Sri Lanka, which does not have a motor car industry or local oil reserves, more vehicles mean a continual drain of scarce foreign exchange, contributing to the ever-widening trade gap. Countries that produce cars for export would naturally want to sell more and more cars to all countries, including Sri Lanka. But the question for us is whether we can afford to have more and more cars in this country. When the present Government reduced the price of fuel following the Presidential election in January, I pointed out in this column that the result would be more road congestion. This is what we all experience today. In fact, many three wheeler drivers are already complaining that traffic is moving much slower than before, making their life more difficult. For them, the benefit of fuel price reduction has already been wiped out by the slowing down of traffic in and around Colombo. Increasing investments in road construction, in the absence of similar or more investments in railways could only lead to disastrous results: more air and noise pollution leading to all kinds of ailments, more deaths and injuries on roads, more expenditure on imports of vehicles and fuel, more congestion leading to more time wasted on roads, a greater sense of inequality among people due to immense competition for road space among different classes of people etc., On the other hand, train travel could be a great leveller. Though trains can have different classes of travel, the gap could easily be reduced by ensuring minimum standards even for lower class travel, while much higher fares for first class travel could get the richer travellers to cross subsidize low income passengers. The use of the same mode of transport can also create a sense of equity among passengers irrespective of the different fares they pay. As is well known, train travel can also be more comfortable and leisurely than road travel even in one’s own car. The tension that one feels on busy roads is usually absent in a well-kept railway compartment. When you travel by train across European cities, you observe many people engaged in productive and leisurely work such as reading and writing. The same cannot be done even in a bus, let alone a motor car. The biggest challenge in the transport sector in this country today is to reverse the present private-public mix. Our transport system is heavily tilted towards private transport today, but the situation was the other way around in the 1970s. The roads are full of all sorts of private vehicles that no efficient and/or safe bus service can be provided to passengers any more. Frequent fatal accidents are only a symptom of the malaise. Growing air pollution, wastage of time and fuel and the negative psychological and social impact of traffic congestion are other dimensions of the same issue. The widening of existing roads and building new roads could be done only at an enormous cost to society. So, our main strategy should be to take as many vehicles off the roads as possible; not to add more and more. This could be done only by revamping the train services in the country. We also need to cut down commuting for education, health and work by improving such services outside large urban centres and creating more income opportunities in peripheral areas of the country. All these would be possible only through systematic economic and social planning.